Raw magic power: the essence of all true fantasy role-playing games. 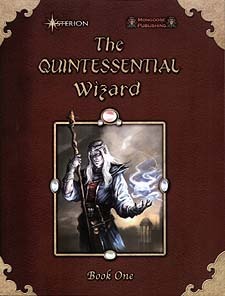 In a world where magic permeates all aspects of daily life, a wizard is the undisputed lord of arcane lore. If you think that a wizard's only way to express his true might is by casting a mundane fireball, take a look at The Quintessential Wizard and think again. In this book you will find a brand-new origins system, over 70 new powers, new rituals, 14 paragon paths, new feats, four new arcane implements, and many magic items specifically designed for arcane casters, including runes. Your wizard will be truly unique and will be able to choose from a wide range of options. This book also features guidelines to play your wizard in combat and noncombat situations, organizations that may help or hinder your efforts, and new rules to build your perfect mansion, a magical tower to keep all your treasures and secrets.